This issue of JointHealth™ monthly is pleased to provide information on what the latest evidence-based research says about exercise. Also, for people who self-inject methotrexate - are your syringes covered under your provincial public health care system? The research literature on exercise is growing, and it is now generally accepted that it has many benefits for arthritis and osteoporosis. General benefits of exercise include improved heart and lung function, weight control, and improvement of self-esteem and self-confidence. The following information is based on the article referenced above. It talks about how the latest research on exercise suggests that moderate exercise is something the majority of people can do and has almost the same health benefits as aerobic exercise. Over time, starting with the industrial revolution, the need for physical labour has decreased for humans both in the workplace and at home. For example, remember the days when one had to get up to change the channels on the television. Now, it's a major inconvenience if one can't find the remote control. As a developed society we sit more and exercise less. This research reported that Americans on average spend 170 minutes (almost 3 hours) watching television each day and 101 minutes (just over 1 1/2 hours) driving. In contrast, they spend less than 19 minutes a day exercising. 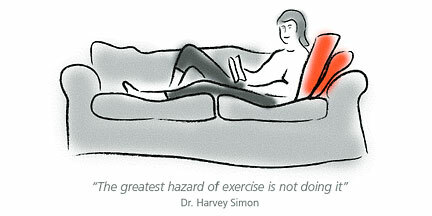 How much daily exercise is needed is a difficult question to answer for two reasons. Firstly, there isn't a general agreement around how much daily exercise is a good amount. Some health care professionals recommend 30 minutes of exercise/day, while others say either 60 minutes or 60-90 minutes. The second reason is the aerobic revolution that began back in the 1960's. During the 60's and 70's aerobics became the gold standard for optimal cardiovascular exercise. Scientific research suggested that aerobic exercise was optimal when the heart rate increased to 70-85% of its maximum* with constant activity to maintain this rate for 20-60 minutes, with a participation rate of 3-7 times/week. In 1975 the American College of Sports Medicine encouraged healthy adults to participate in aerobic exercise 3 times/week for 20-30 minutes with a heart rate of 60-90% of their maximum heart rate. These guidelines were modified by the American Heart Association and the US Department of Health and lasted over 20 years as exercise guidelines. *Maximum heart rate: refer to the June 2005 issue of JointHealth™ or go to: June 2005 - Exercise, arthritis and osteoporosis . If you do not have internet access, call or write ACE if you would like a print edition of the June newsletter. Running became a popular form of aerobic exercise with the ultimate success running a marathon, which is 26 miles long. However running was not popular with the majority of Americans. Today the research suggests still says that aerobic activity is great for becoming and maintaining fitness and health, however, moderate exercise has many health benefits too. Moderate exercise is something that the majority of people can do but unfortunately the research suggests that the majority of people are not doing. Why? There is still a belief that aerobic exercise is the best and moderate exercise is nowhere close to having the same effects. The following table compares studies looking at some of the benefits of moderate exercise. The chart shows that walking has major health benefits for lowering mortality rates and cardiovascular events. Walking is a type of exercise that most people can participate in at some level. 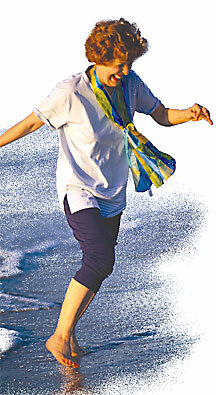 ACE talked about the benefits of walking in the March 2006 issue of JointHealth™ monthly- the 10,000 step program. To view this article, click here, or call ACE to receive a print copy in the mail. ***Remember - before starting an exercise program, at home or at a gym, it is important to speak to a health professional trained in exercise for arthritis and osteoporosis. They can help you to design an exercise program that will be both safe and effective. Are your methotrexate syringes covered? ACE has heard from some of its community members regarding availability and out- of-pocket costs to purchase syringes for methotrexate (Rheumatrex®) injections. Methotrexate is a disease-modifying antirheumatic drug (DMARD) used to treat rheumatoid arthritis, lupus and other forms of arthritis. This type of therapy is usually given by a self-administered injection, generally once a week. It is available in an oral form but less of the drug is absorbed. Increasingly, there are more medications being given by injection for arthritis, osteoporosis and other conditions. At present, the cost of the syringes and needles is the responsibility of the consumer/patient. It is important to note that if these drugs were dispensed in pre-loaded syringes, the cost would be included in the price. All public drug plans cover the cost of methotrexate itself but no plans cover the cost of the syringes. For diabetes, the cost of the syringes is covered by public health plans for the required daily injections of insulin. Injections are also necessary forms of treatment for some of the inflammatory types of arthritis. Both diabetes and arthritis are chronic diseases requiring injections to control the disease. This is an important issue and ACE would like to hear from you. Let us know how you feel about paying for syringes for your arthritis medication, and whether it impacts on your ability to take methotrexate as prescribed. Write or email ACE at: feedback@jointhealth.org. We look forward to hearing from you. ACE will go to government with its community member concerns regarding this issue.